This week, our government co-hosted the annual Investment Forum and Property Tour with the Yukon Mining Alliance (YMA). This partnership between government and industry is recognized by global resource leaders as an enviable model for mining promotion. Now, more than ever, it is important to stand up for our resource industry and this government is ensuring that no one out-promotes Yukon as a great place to do business. The tour has proven invaluable over the past several years. Other ministers, government staff and I have engaged with potential investors, resource media and local industry, as well as First Nation leaders and development corporations to discuss priorities for the mining industry and the future performance of the sector. This year, we heard promising stories of mining’s emergence from the worldwide mineral downturn. Yukon supply and service businesses are seeing increased demand from clients and activity has picked up at the mining recorder’s office in Dawson. Investors are once again looking to Yukon as a great jurisdiction to invest in and to do business. Just this past January, Kaminak Gold Corporation announced positive feasibility results from its exploration of the Coffee Gold Project, located south of Dawson City. Since then, the company has been acquired by Goldcorp Inc., one of the world’s largest producers of gold. Goldcorp’s confidence in Yukon has served notice throughout the mining industry that Yukon is ready for business and that we have done everything we can to prepare for the next upswing in mineral markets. Our government has been focused on the things we can control, to best position the territory for the mining sector’s emergence from the global downturn. We have invested in training for Yukoners, built infrastructure so that workers with mining-relevant skills remain in the territory and projects can benefit, endeavoured to improve our regulatory and assessment regimes, and actively promoted Yukon as a great place to invest. The forum and tour are key aspects of our government’s greater commitment to promote and support investment in Yukon. We have dedicated $1 million to the YMA over the next three years, allowing them to facilitate a number of events and conferences that will continue to showcase mining opportunities in Yukon to the rest of the world. Our government takes the time to network with industry leaders, build relationships with investors from other countries and encourage more foreign investment in Yukon-based exploration projects. This approach has laid the foundation for future success in the mining sector. World leaders like Goldcorp understand the potential here and the great work of this government to make it happen. The mining industry wants to be in Yukon and this government will continue to partner to make it happen. 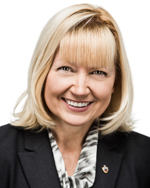 We have exceptional potential for future resource development, and with the combined efforts of our government, the Yukon Mining Alliance and Yukon First Nations development corporations, it is clear that we will be well-positioned when the inevitable upturn in resource markets occurs. Our government understands business and will continue to encourage investment in the mining sector, while at the same time ensuring responsible development here in Yukon. This week, the Yukon government was pleased to jointly announce with Kwanlin Dün First Nation (KDFN) that the new Land Titles Act, 2015 and accompanying regulations have now come into force. This new legislation modernizes the system by bringing clarity and certainty to the existing market and in turn creates a better platform for responding to the increased volume and complexity of land transactions today. The new regulations will streamline policies, process and procedures and will allow for a smooth transition to a new electronic system. 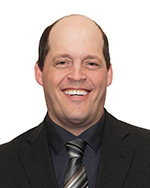 These changes will accommodate new circumstances, provide Yukoners with more accessible information, and create a framework that better protects the interests of property owners. The legislative framework will also help support Yukon’s real estate market and open avenues to provide more options for economic development. Under the new act and regulations, Yukon First Nation Category A and Category B Settlement Land can be registered at the Land Titles Office in a manner that preserves aboriginal title. 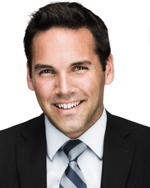 For the first time in Canada, settlement land can be registered without impacting aboriginal rights. 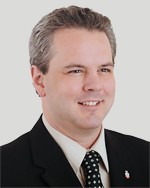 This will offer new economic opportunities to participating First Nations for residential, commercial, and agricultural development, and the opportunity for increased home ownership by individual First Nations citizens will be facilitated as a result of better access to mortgage financing for homes on settlement land. While First Nations across the territory have been updated on the progress and given the opportunity to provide input, Kwanlin Dün First Nation in particular has been a key partner in developing this historic piece of legislation. The KDFN lands branch and legal counsel worked with Yukon Government staff on the aboriginal title of land parcels while allowing First Nations to access a stable registry system in which financial institutions, lenders and investors have confidence. It also provides a strong framework to protect the legal rights of residential, commercial, and agricultural interests. The development of the updated act is part of the Land Titles Modernization Project, which was launched to keep pace with the ever-changing environment in modern land dealings. Since 2012, the project has engaged numerous stakeholders through advisory committees, public comment, and consultation to identify the key issues and outline the direction the government should take moving forward. The new legislation was passed this past fall, and the government has been hard at work developing the regulations with technical input from stakeholders. This partnership and collaboration has made the potential economic growth through land registry and development achievable for the citizens and government of Kwanlin Dün, and all settled Yukon First Nations, should they choose to implement this system under their Final and Self-Government agreements. There is no obligation to do so, and the choice to register land parcels will remain in the hands of the respective First Nation. The Land Titles Act, 2015 as a whole creates our territory’s first fully modern title system that ensures the interests of property owners, investors, and all Yukoners when it comes to modern land transactions. Tourism has always been a key sector for Yukon and it continues to be an important part of our economy. Every visitor who enters our territory spends an average of $82 per day in the summer and $150 per day in the winter. That’s new money that flows directly into our economy driving job creation and creating a better quality of life for our families. Contained within the 2016/2017 territorial budget are a number of strategic investments in support of Yukon’s tourism industry. Most significant is the commitment of $2.7 million for the continuation of the ever successful Yukon Now marketing program. Yukon Now is not only the single largest investment in tourism marketing but is perhaps the most successful program ever to be undertaken in Yukon’s history. I would like to acknowledge and thank the Tourism Industry Association of Yukon and the Yukon Chamber of Commerce for sharing their vision to increase the awareness of Yukon as a travel destination and to see a greater investment in television marketing. Yukoners can be justifiably proud of the commercials that were produced and the contribution of Yukoners, industry and government. Over the past decade, First Nations have experienced a tremendous cultural resurgence through the sharing of stories, song, dance and art. We’ve seen the creation of new festivals such as Adäka, celebrations such as Hà Kus Teyea biennial gathering and the inaugural drum and dance festival that was held in Haines Junction last summer. We’ve seen the emergence of dance groups such as the Dakhká Kwáan dancers. We’ve seen the construction of new cultural centres, such as the Kwanlin Dün Cultural Centre and the Da Kų House in Haines Junction, and are seeing new tourism experiences emerging throughout the territory. This rich cultural tradition is a key piece of what attracts visitors to our territory and is an important part of what makes Yukon unique. The Yukon First Nations Culture and Tourism Association (YFNCTA) has played an integral role in the development of Yukon First Nations’ arts, culture and tourism sectors. Recently, we were pleased to sign a partnership agreement with YFNCTA that reflects the importance of supporting and strengthening Yukon’s tourism and culture sectors. Our government was also pleased to support their work with an increase of $100,000 in annual operational funding, for a total of $160,000. This year, we have also committed $1.84 million in support of the 11 Yukon museums and the seven Yukon First Nation cultural centres, growing the overall budget by more than 300 per cent since 2002. 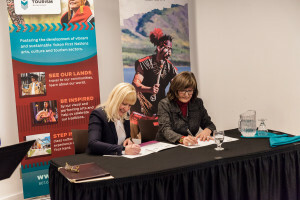 Minister Elaine Taylor and Yukon First Nations Culture and Tourism Association president Shirlee Frost sign a new increased funding agreement in March. We are improving Yukon government campgrounds with $248,000 in this year’s budget for campground infill and expansion, as well as $52,000 for basic infrastructure upgrades to outhouses, fire pits, docks, signage and kiosks. In addition, $50,000 will go towards developing universal access around our campgrounds, particularly for mobility-challenged visitors. We have also extended the camping season with earlier openings and later closings and opened Yukon’s first new campground in almost 30 years, Conrad Campground on Windy Arm. The budget also includes approximately $56 million for highways, roads, bridges and airports. These investments are also integral to the growth of tourism and a driver of job creation across the territory. As we look to this year, a weaker Canadian dollar, lower oil prices, strong air access, and increased awareness of Yukon as a travel destination all bode well in favour of a strong tourism economy in Yukon. Looking further ahead, Yukon is looking forward to celebrating Canada’s 150th anniversary and the 75th anniversary of the Alaska Highway with visitors and the rest of Canada. I would like to acknowledge and thank the many individuals, organizations and governments for the work being done to promote Yukon as a larger than life destination, providing exceptional and unique experiences to visitors. The Yukon government is a proud partner with the shared goal of creating and maintaining a strong, vibrant and sustainable tourism industry. Through partnerships, we can ensure that tourism remains a vibrant, strong contributor to Yukon’s economy. Our Yukon Party government is committed to ensuring all Yukoners feel safe and secure in their own homes and communities. Whether it be through RCMP presence, reliability of emergency medical services (EMS) or the development of community programs, we have made the safety of Yukoners a priority. My colleagues and I have been working continually to support and expand EMS and 911 service across the territory. This year, an important step toward improving services has been the Yukon government’s investment of $334,000 with an additional contribution of $142,000 from the Government of Canada to relocate our 911 call centre to the Emergency Response Centre on Two Mile Hill. The call centre, our new Public Safety Answering Point (PSAP), was opened in February of this year. It is operated by the RCMP and has the necessary equipment to allow an easy transition for the upcoming expansion of basic 911 service Yukon-wide. Additional funds have been allocated to hire more RCMP operators to accommodate an expected increase in 911 calls when the expansion is complete. We also recognize that Yukon-wide 911 service will require enhanced response coordination, particularly in Whitehorse and the surrounding area. We have a new EMS station located on the Whitehorse General Hospital campus, which houses two ambulance crews and the Yukon Emergency Response Coordination Centre. The Centre dispatches ambulances within the Whitehorse service area and coordinates medevac and patient transfers for the territory. 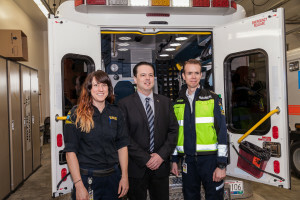 Minister Brad Cathers at the March 2016 official opening of the new emergency medical services station on the Whitehorse General Hospital campus. In addition, Yukon EMS received two new ambulances this year and a total of eight since 2011. The Yukon government has also committed funds to purchase 12 new fire vehicles since 2011. Improving emergency medical services and their response times are key to maintaining the well-being of Yukoners, while a strong enforcement sector plays an important role in security. In this year’s budget, the Department of Justice is providing $385,000 to the RCMP to fund five additional officer positions, which will add capacity for the first responders who are providing round-the-clock public safety coverage. This will allow our members the flexibility of focusing their resources on engaging the community, while still being able to build on proactive policing and crime reduction strategies. In regards to further proactive strategies, we are also providing $21,000 in start-up funding for the return of an improved Crime Stoppers program, which will be led by community volunteers and will be based on an anonymous tip and reward system. This valuable tool helps promote citizen engagement in responding to criminal activity and encourages members of our community to take responsibility for keeping their neighbourhoods safe and crime-free. Finally, in addition to EMS and crime prevention, partnership between our government, municipal governments and Yukon First Nations is another key element in providing the best possible service in keeping Yukoners safe. Partnerships in communication and enforcement allow all parties to coordinate programs and work toward shared goals. Together with Kwanlin Dün First Nation (KDFN) Chief Doris Bill, the Premier and I were pleased to announce more than $1.4 million in territorial government funding over three years to the KDFN for its Community Safety Liaison Officer pilot program. This was in response to the numerous calls to increase safety measures in KDFN community and is aimed at building KDFN capacity in providing accessible, sustainable and culturally-relevant justice services, while promoting community accountability, responsibility and respect for the law. We are proud to be partners in this community-led initiative and look forward to seeing tangible results from its implementation. This government remains dedicated to the safety and well-being of citizens in all our communities. We will continue to demonstrate that through funding and partnerships with other governments and organizations across Yukon. Thank you.